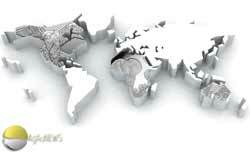 Without doubt the most prolific releasers of commemorative coins, the Royal Canadian Mint issues more series of coins that anybody else on the market. 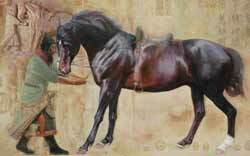 They specialise in three main subjects; nature, history and maple leaves. 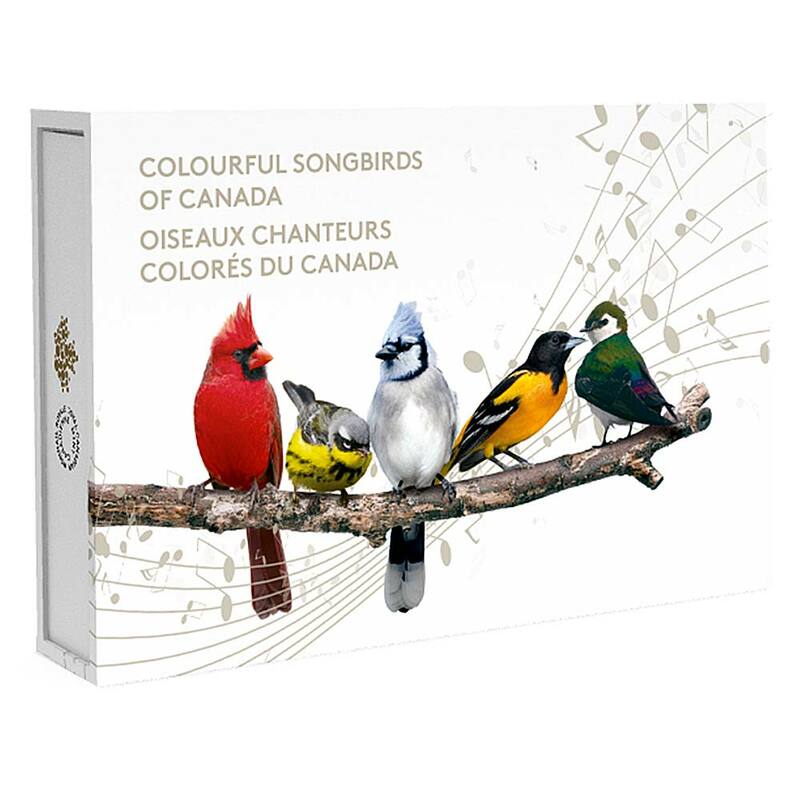 This series sits firmly in the first category and features five of the most well-known and loved Songbirds that populate Canadian skies. 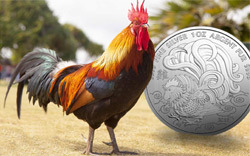 There’s nothing particularly different about the format used as it’s a standard RCM style, that is a 34mm half-ounce fine silver round with selective colouring. 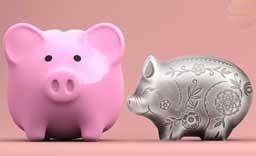 As it’s a common RCM style, it goes without saying that quality is high and the design excellent, with colour used sparingly and well. 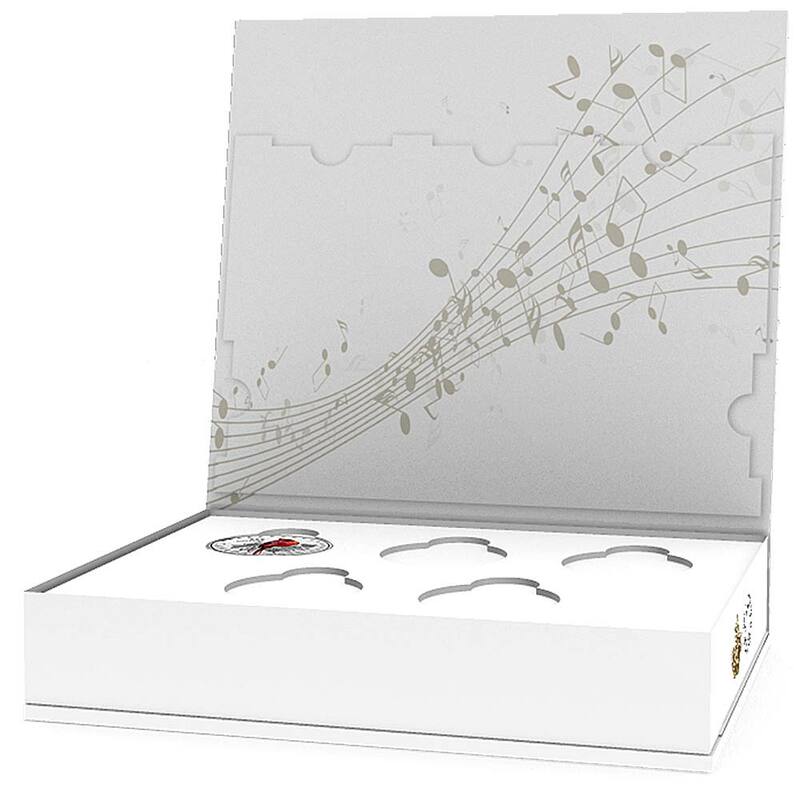 Each coin comes in the usual burgundy snapper case with a colourful shipper, but it certainly looks worth getting hold of one of the musical coin boxes that hold the entire set of five coins. 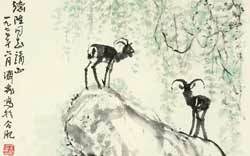 The subjects are a great selection of some of the most colourful birds that populate this beautiful country. Each simply depicts a coloured image of the bird placed on a clean-struck representation of some flora that the bird perches on. The $10 denomination and the words CANADA 2015 are also inscribed on this face. 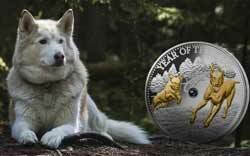 All of the coins sold for $64.95 CAD each and at the time of writing all were still available. A very nice set with a great appeal for Ornithologists or simply lovers of birds. With its brilliant red plumage and a distinctive crest atop its head, the Northern Cardinal (Cardinalis cardinalis) easily draws attention to itself wherever it is found. From southern Manitoba east to the Atlantic provinces, the beloved cardinal is one of many colourful songbird species that are testament to the inspiring beauty of nature in Canada. • Usually male songbirds are the ones who sing; not so for the northern cardinal! Both the female and the male northern cardinal sing, using a variety of melodies to communicate. • Northern Cardinals can be surprisingly territorial, especially during the breeding season. It’s not unusual to see a northern cardinal attack its own reflection if it feels compelled to defend its territory against this ‘intruder’. 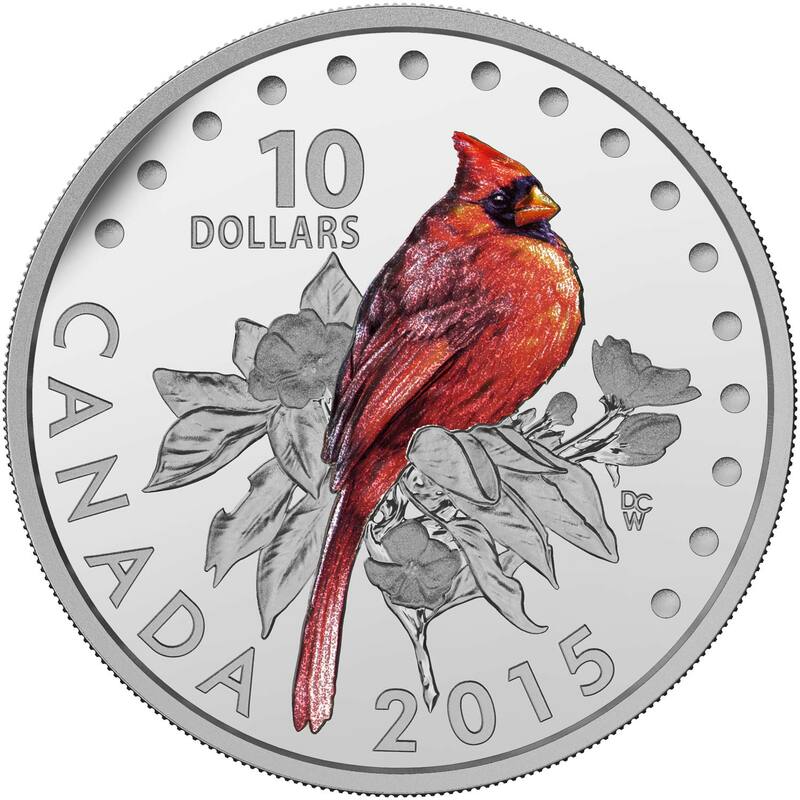 DESIGN: The reverse design by Canadian artist Derek C. Wicks features a beautiful rendition of a northern cardinal in a tranquil setting. Finely detailed engraving showcases this songbird’s distinctive features – from the pointed crest atop its head to its thick, short bill, as well as the soft feathers that lead to its tail. The use of selective colouring recreates the northern cardinal’s brilliant red plumage viewed in three-quarter profile, as the bird sits nestled amidst engraved leaves and flower blossoms. Despite its small size, the magnolia warbler (Setophaga magnolia) is easy to spot thanks to its bold black-and-yellow colouring. This little songbird sings almost constantly, filling the summer air with a series of clear, sweet whistles as it flits along the lower branches of the surrounding trees. Unless protecting its young, the warbler hardly seems shy; it is often seen spreading and flicking its tail feathers in a proud display of its colours. During the breeding months, this delightful songbird can be found in coniferous forests across Canada, from Newfoundland and Labrador to British Columbia. Its energy, colours and song make the Magnolia Warbler a welcome summer resident whose presence only adds to the natural beauty of Canada’s wilderness. • This songbird’s name traces back to 1810 when famous ornithologist Alexander Wilson collected a specimen from a magnolia tree—hence the “magnolia” in its Latin species name. Over time, “magnolia” became more commonly used than the bird’s original English name, the black-and-yellow warbler; and yet, this species has rarely been seen in a magnolia tree since! • Depending on the situation, the male magnolia warbler has two distinct songs; one for courtship and nesting, and a less accented one that may be used when defending its territory. 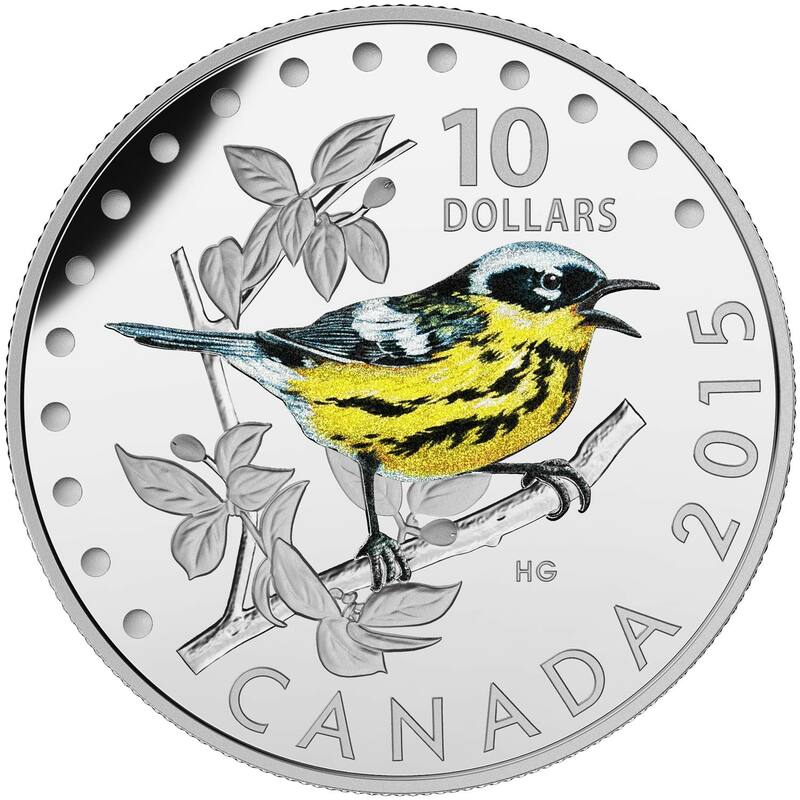 DESIGN: Designed by Canadian artist Hélène Girard, the coin offers a side-profile image of the magnolia warbler. The warbler’s distinctive colouring is faithfully recreated through the use of selective colour, which beautifully showcases the bird’s black-streaked yellow underparts with its white-banded black tail and wing. Its sharp, black beak is open as the songbird releases a series of clear whistles from its perch in a plum tree, which fills the background on the left side of the design. Smaller than a crow but larger than a robin, the blue jay (Cyanocitta cristata) is instantly recognised by birdwatchers young and old thanks to its near-exotic, blue-hued plumage. And given the jay’s loud cry, its scientific name—which means “crested, blue chattering bird”—seems particularly fitting! 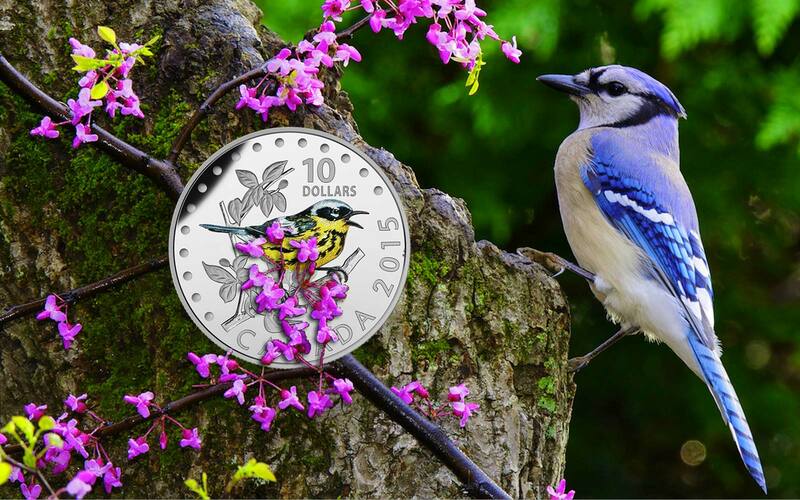 This intelligent bird is one of Canada’s most beloved songbirds, and its beauty is forever immortalised in this stunning coin. • As a member of the crow family of birds, or Corvidae, the blue jay boasts an ancient lineage—corvids have been found in fossils that date back to 25 million years. • The blue jay feasts upon acorns—so much so that it is thought to be responsible for the spread of oak trees after the last glacial period! • You can tell the jay’s mood by the position of the crest atop its head: if it’s feeling excited, surprised or aggressive, the crest will rise prominently; if it is frightened, it will bristle out like a brush; and if feeding peacefully or tending to nestlings, the crest will lay flat on its head. 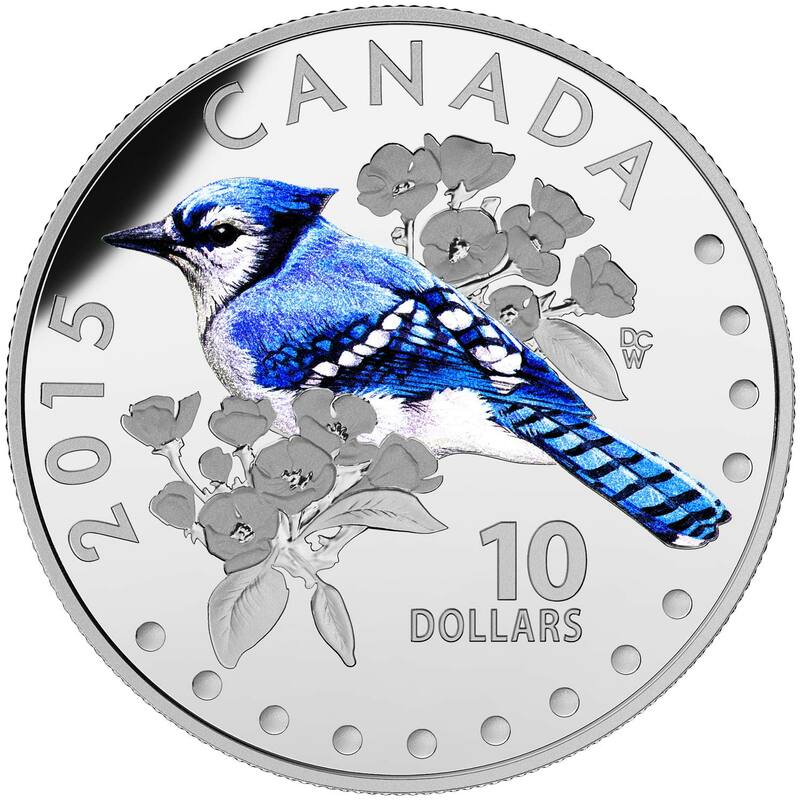 DESIGN: Designed by Derek C. Wicks, the coin features a side profile image of a blue jay, which allows for an optimal view of the bird’s contrasting feather patterns that make it so unique. The blue hue for which the jay is famous for is recreated with selective colour that enhances the coin’s detailed engraving, including the meticulously rendered pear tree blossoms that surround the colourful songbird. 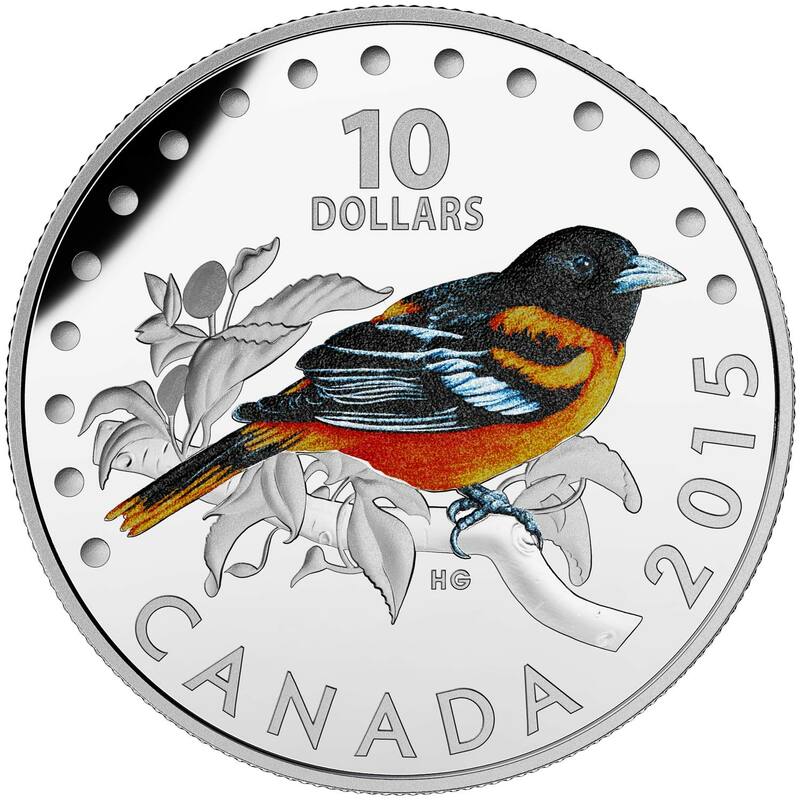 DESIGN: The reverse image by Canadian artist Hélène Girard offers a side profile view of a Baltimore oriole rendered with selective colouring. The songbird’s solid-black colour carries from its head through to its wings where it mixes with bold white markings, then down to its orange-tipped tail. But it is the bird’s blazing orange underparts that catch the viewer’s eye, betraying its presence amid the engraved foliage of a wild plum tree. 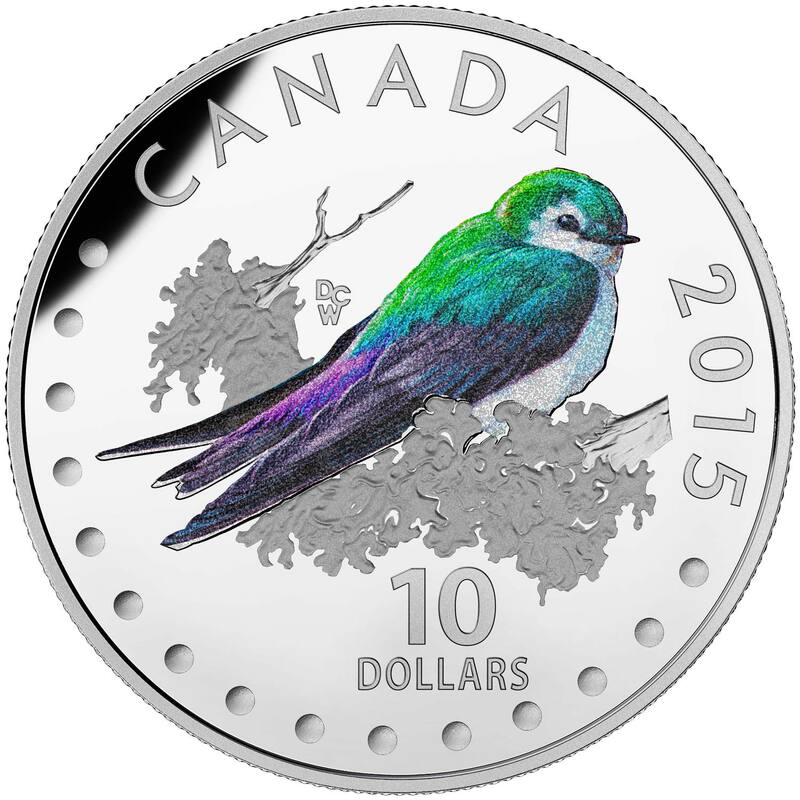 DESIGN: The reverse design by Canadian artist Derek C. Wicks recreates the violet-green swallow’s breathtaking green and blue-hued plumage and violet tail through the striking use of selective colour. Taking a break from its aerial hunting activities, this insectivore is perched on a swooping tree branch that is covered in western tree lichens. The clean contrast between the metallic-like upperparts and the bright white underparts further enhances the detailed pattern, bringing stunning depth and dimension to the overall composition. 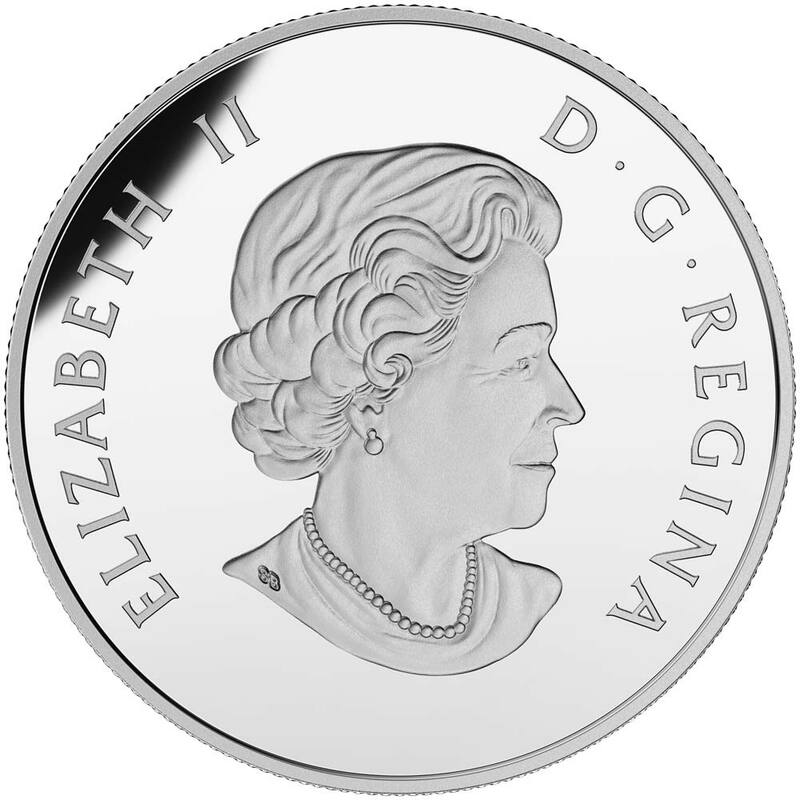 As with pretty much all of the Royal Canadian Mints normal releases, these coins carry the Susanna Blunt effigy of Queen Elizabeth II. The packaging is quite a bit more inventive however. The coins were sold by subscription as well as individually, and those that signed up for the subscription recieved a box to hold the whole collection with the fifth and final coin. The box when opened plays the sounds the five birds make with a classical melody in the background. A nice and clever touch that suits the collection well. 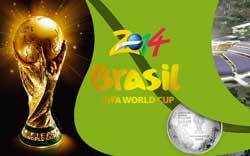 We’ve not seen the box for sale seperately, but it may be worth asking your local dealer if you’ve been buying the coins individually and would like one.